St. Martin's Griffin, 9781250068613, 288pp. At nineteen years old, Nicole C. Kear's biggest concern is choosing a major--until she walks into a doctor's office in midtown Manhattan and gets a life-changing diagnosis. She is going blind, courtesy of an eye disease called retinitis pigmentosa, and has only a decade or so before Lights Out. Instead of making preparations as the doctor suggests, Kear decides to carpe diem and make the most of the vision she has left. She joins circus school, tears through boyfriends, travels the world, and through all these hi-jinks, she keeps her vision loss a secret. When Kear becomes a mother, just a few years shy of her vision's expiration date, she amends her carpe diem strategy, giving up recklessness in order to relish every moment with her kids. Her secret, though, is harder to surrender - and as her vision deteriorates, harder to keep hidden. As her world grows blurred, one thing becomes clear: no matter how hard she fights, she won't win the battle against blindness. But if she comes clean with her secret, and comes to terms with the loss, she can still win her happy ending. 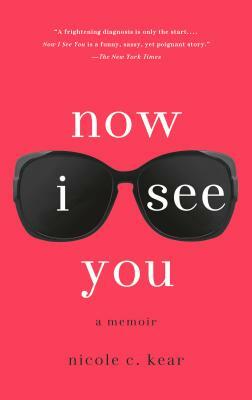 Told with humor and irreverence, Now I See You is an uplifting story about refusing to cower at life's curveballs, about the power of love to triumph over fear. But, at its core, it's a story about acceptance: facing the truths that just won't go away, and facing yourself, broken parts and all.